Is &quot;Shrek&quot; a conventional fairytale? 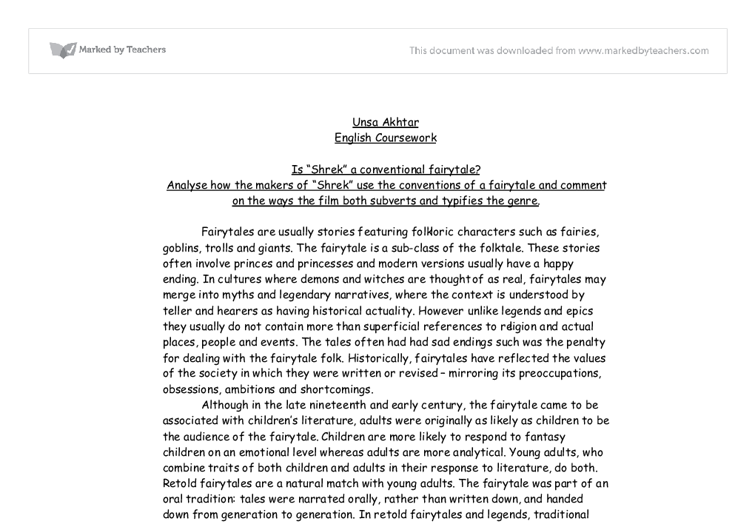 Unsa Akhtar English Coursework Is "Shrek" a conventional fairytale? Analyse how the makers of "Shrek" use the conventions of a fairytale and comment on the ways the film both subverts and typifies the genre. Fairytales are usually stories featuring folkloric characters such as fairies, goblins, trolls and giants. The fairytale is a sub-class of the folktale. These stories often involve princes and princesses and modern versions usually have a happy ending. In cultures where demons and witches are thought of as real, fairytales may merge into myths and legendary narratives, where the context is understood by teller and hearers as having historical actuality. However unlike legends and epics they usually do not contain more than superficial references to religion and actual places, people and events. The tales often had had sad endings such was the penalty for dealing with the fairytale folk. Historically, fairytales have reflected the values of the society in which they were written or revised - mirroring its preoccupations, obsessions, ambitions and shortcomings. Although in the late nineteenth and early century, the fairytale came to be associated with children's literature, adults were originally as likely as children to be the audience of the fairytale. Children are more likely to respond to fantasy children on an emotional level whereas adults are more analytical. ...read more. This is not typical of a fairytale as the hero who desires the princess is meant to rescue the princess themselves whereas in "Shrek", Lord Farquaad prefers to send Shrek to rescue the princess for him. Shrek complains and Lord Farquaad orders the knights in the tournament to kill Shrek. In the fight the follows, punk music is played in the background to accompany the fighting, which consists of modern wrestling moves e.g. "Give him the chair!!" The fighting sequence uses various overhead shots of the wrestling ring. Shrek becomes popular with the audience. Scenes like this do not happen in conventional fairytales. Lord Farquaad decides to send Shrek to save Princess Fiona. There are different scenes shown in the journey made by Shrek and Donkey on the way to save Princess Fiona. Making them walk together through the lands and sitting by a campfire at night are shown by long shots of Shrek and Donkey. These scenes suggest bonding between these two characters. Very subtle touches like this are not common in animated features. 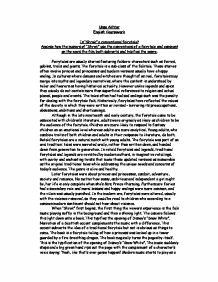 The story so far is not at all similar to any fairytales but as it carries on, the spoofs and clich�s broaden. When Donkey and Shrek reach the castle, it is run-down, in the middle of a volcano with a rickety bridge in the middle of a thunderstorm. ...read more. A slow ballad plays as the characters are seen without each other. Shrek still not happy at his swamp, Princess Fiona at Lord Farquaad's castle looking miserable and Donkey sitting by a river looking lonely until he notices the dragon that guarded the castle beside him. When Donkey and Shrek finally make up and go and save Princess Fiona from Lord Farquaad, DreamWorks Productions give the clich� of Shrek bursting in just as Lord Farquaad and Princess Fiona are about to kiss. This is a very typical ending for a fairytale where Shrek and Lord Farquaad see the princess in her true form, Lord Farquaad is eaten and Shrek and Princess Fiona get married. In conclusion, I think "Shrek" is not a conventional fairytale. It may have a happily ever after but it got there in a very different way to other fairytales. It spoofs other fairytales to make the storyline flow better. Most of the humour lies in anachronisms, clich�s and exaggerated stereotypes however the camera shots throughout the whole movie make it more realistic. The soundtrack of the movie is very different from Disney's take where the music was much more fairytale-ish. Using other fairytales was genius because the comedy was appropriate. The comedy can be understood by all ages, which is good because the movie can be watched by all ages. And I also like the way Donkey's mood can be expressed just by his ears. ...read more. swamp is the fact that he has a shower, a dining table, and a cosy fire place with a comfortable armchair. Shrek is seen having a shower, brushing his teeth and doing everyday human activities. This indicates to the viewers that this won't be a normal everyday fairytale story. To see a character in a film passing wind or being disgusting would not have been acceptable in the 1930's and so this contrasts with Snow White. of fighting them Shrek offers to "settle this over a pint" which is something a normal ogre probably would not do. After they leave duloc to rescue Princess Fiona, donkey continues to annoy Shrek and says that he should not have to put up with lord farquad and he should "pull some ogre stuff" to sort him out. This ultimately shows that racism is everywhere and also this concept of involving Shaniqua furthered the notion on everyone's lives inter-linking with in this period of 36 hours. On the other hand, in 'East is East', it ends with George hitting his children and wife, also through anger. Marketing plan for the Hindustan Times. Table3.1 According to the "GROWTH SHARE MATRIX" of Boston Consulting Group we could place publications 'Nandan' and 'Kadambini' in DOGS category. They are struggling in low growth market with low share. You are immersed in the battle and are desperate to reach safety. The colours are now beginning to get brighter as the soldiers progress further and further up the hill and towards victory. The once dreary impossible looking mission is given life and hope, a chance to win. This helps you remember him because although Pip is different in many ways to Compeyson they have some similarities. I will look at these limitations in more detail throughout the analysis of the episode, "Seeing Red". Between 1892 and 1969, sexual expression of homosexuals was criminalized by laws that rendered gay men particularly vulnerable to be labelled as "dangerous sexual offenders".